We are forever indebted to our loyal supporter, Anthony Handy, who has recently completed his second marathon in recognition of 16 year old Harry, who has myotubular myopathy. Anthony chose to take part in the Kielder Marathon, which he also completed in support of the Trust in 2012. This marathon is one of the toughest you can enter – it’s renowned for its challenging hills but also for the stunning scenery en route. We were glad to hear that Anthony was able to enjoy the stunning views! “Having completed one Kielder I was eager to do it again for the Myotubular Trust. I camped over the night before in Kielder Forest on a cold wet night. Months of training were behind me and I was as ready as I would get, sleep came surprisingly easy due mainly to the fact that next day’s pain was inevitable and nothing I could do now would change that. Morning came and it was misty but dry. As I arrived at the start line I was instantly reminded of the buzz of excitement that accompanies this epic race. We started off and the anticipation gave way to steady footfall and camaraderie, it soon came back to me how hard this particular race is, and it became apparent that I had slightly underestimated it! Again! I soon got into a steady run and didn’t start struggling until mile 18, I then struggled for the remainder of the race. The beauty of the venue and thoughts of Harry got me to the finish line, and thanks to the encouragement and light hearted competitiveness of a runner in a tough mudder T-shirt, I sprint finished the last 600 yards (and lost). 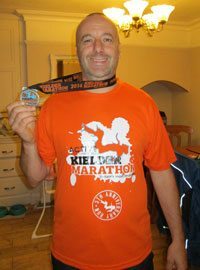 Then with a huge smile, sore body parts and cramp setting in I collected my second Kielder Marathon T-shirt and grinned from ear to ear. Thank you so much Anthony for doing this yet again for the Trust and for raising another substantial amount in sponsorship. We are so grateful to you and very impressed.